All transactions are safe and secure with a reliable history in online purchasing behind each of our associates. 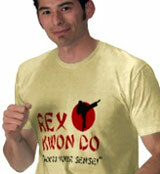 Buy the Rex Kwon Do Napoleon Dynamite t-shirt to own Napoleon Dynamite clothing and merchandise. This Rex Kwon Do Napoleon Dynamite tee advertises the Rex Kwon Do martial arts dojo, where for $300 sensei and ex-ultimate fighter Rex (Diedrich Bader) can train you. In the movie, Uncle Rico tries to sell Rex's wife Starla breast enlargement supplements. Rex considers this an insult and severely beats Rico. Like Liger shirts, Rex's outfit is a great idea for a Napoleon Dynamite costume. In addition to the Rex Kwon Do Napoleon Dynamite tee above, browse the Napoleon Dynamite Clothing Gallery for more apparel like men's and women's clothes, kids shirts or hoodies.